Without a second thought, Seresto Dog Flea and Tick Collar is the best flea collar for dogs in the market currently. Granted, it’s a bit expensive but the effectiveness of this treatment is unmatchable by any other product. However, if you want something more budget-friendly, UltraGuard Flea and Tick Collar could be your go-to product. Your beloved dog’s life could depend on how well you can keep them protected during the flea and the tick season. Flea bites are bound to be itchy and if they continue to breed, they can also lead to hair loss. Any dog lover would know how difficult it is to keep a track of your dog’s movements, especially when playing around the park or when out on a walk. Since it is so very difficult to keep a strict watch on your dog, it is essential that you invest in the best flea collar for dogs. According to me, the best flea collar for dogs is by far the Seresto Dog Flea and Tick Collar. The best part about the collar is that apart from fleas, the collar also repels larvae, lice, ticks and even nymphs. Talk about an all encompassing protection. The fact that the band can be used on a wide variety of dog species only increases its appeal. However, I would personally always recommend that you discuss what your dog might possibly need with a practicing veterinarian. The vet could offer you the best advice on the type of product you must use. Here are some of the most popular dog collars in the market which could possibly serve as the best flea treatment for dogs. My dog is very dear to me, and I would go to some extent to protect it from flea and tick infestation. Bayer from ﻿Germany is a known name in pet-collar manufacturing, and the new Seresto from the house of Bayer looks really promising. Seresto collar offers a massive eight months of flea and tick immunity, which surpasses any regular flea and tick collar available in the market. This collar can be used for any large breed like Great Dane, English Mastiff or German Shepherd. The collar is easy to use, effective, and easily adjustable - it definitely won’t be an unpleasant experience for your dog. The manufacturers, as well as Seresto collar reviews ensure a superior performance from this collar. It uses active ingredients like imidacloprid and flumethrin, which in turn shield your dog from flea, lice, tick and larvae of these. A fascinating aspect of the collar is the advanced sustained release technology. This technology ensures that the active ingredients are slowly discharged over the span of 8 months. 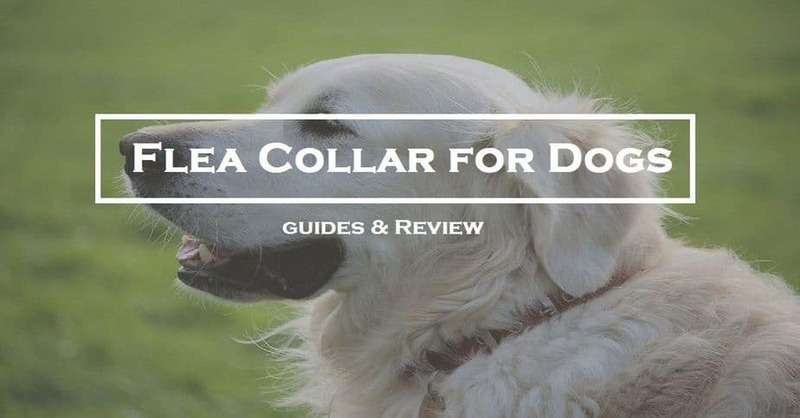 As a direct consequence, the collar stays active for a prolonged period to give your dog round-the-clock protection from fleas and ticks and checks re-infestation. The collar is not damaged by water, so, you can take your dog for a bath or swimming once in a while without much worry. Seresto collar also remains unaffected when exposed to rain or the sunshine. However, while it’s water-resistant, frequent contact with water can lower its working potential to five months. Moreover, as a bonus feature, the collar incorporates an emergency release mechanism, which is a very unlikely feature for a pet collar. But think it this way, your pet is trapped and you are nowhere near the tragedy. Et voila. The release mechanism empowers your dog to take care of itself in the case of an emergency, as its own strength will be enough for a quick release. All things considered, Seresto proves to be the best flea collar for dogs. May not suit your dog, but chances of that are low. You can probably imagine how uncomfortable it would be for your dog to scratch its back all day. Infestation of pests like flea and tick can make the life of your dog a living hell. And if you are a sincere owner, you must be aware of the consequences these can have. Fleas, ticks, and lice - these are bloodsucking parasites and can leave a painful biting mark on the body. If these biting spots get infected, things can get out of your way in no time. Above all, there’s always a chance of fatal diseases being spread. Seresto Flea and Tick Collar from the house of Bayer can put an end to all your worries. Hailed as one of the best flea collar for dogs by Seresto flea collar reviews, this German-made product will let your dog live a life without flea and ticks for a tentative 8 months, which is an exclusivity in the market. This product is applicable to small breeds like Boston Terrier, Spaniel, Chihuahua and Havanese. Seresto uses an advanced blend of materials referred to as ‘polymer matrix’ to create a product of increased efficiency. The polymer matrix is able to sustain the active ingredients necessary to kill the harmful pests and prevent re-infestation. Bayer excels in the field of Material and Crop science to offer a product of value such as Seresto. And the regulated low-dose release of the active ingredients ensures that the collar lasts as promised. Seresto comes with a water resistant technology, which means you should not worry about it being affected by rainfall and monthly bathing exercise. However, to ensure the longevity, you might want to open it when you’re taking your dog for swimming or for a bath. The safety opening mechanism is one more thing to talk about, as it allows your dog to escape the collar in case of emergency. Moreover, Seresto goes through a number of tests before packed and marketed, so the safety of your dog is guaranteed. The ingredients are locked inside the polymer, which means Seresto is also safe for your family, and above all, the environment. Considering all aspects, Seresto provides the best flea treatment for dogs. #3. Virbac Preventic Tick Collar, Large Dog, 25"
If you are specifically concerned about prevention against ticks, then you would want to think of another cheap option instead of Seresto. Monsoon is the picking season for ticks, and they are vectors to a number of dangerous diseases. Virbac is an experienced name in pet-parenting, and the new Preventic collar by them effectively protects your dog from tick infestation. The new Preventic collar is specifically designed for killing and detaching ticks from the skin of your dog. It uses the antiparasitic drug Amitraz instead of flumethrin which rapidly paralyzes ticks and fleas before killing them, ensuring easy detachment. It starts showing significant result within 24 hours of application and reaches its full potential within 48 hours. Preventic uses a slow discharge formula to last longer, and consequentially, it can act as a shield against fleas for up to 3 months. Moreover, the formula also ensures that the active ingredients are uniformly applied on the skin. The box contains a how-to guide along with the collar to make things easier. Generally, this product is for large breeds but you can also cut it down to fit your dog. This collar is also water resistant, but you might want to remove it from the dog during baths and reapply it later to make sure that it lasts as promised. Also, you should consult a veterinarian before applying this collar to puppies of less than 12 months of age. So, if you want a cheaper and yet effective solution for a severe flea and tick infestation problem, you would want to consider this option. Dedicated tick prevention for up to 3 months. Not applicable to puppies under 12 months of age. The 18” variant of Virbac Preventic packs the same efficiency and safety against tick infestation but for smaller breeds like Chihuahua and Spaniel. Quite simply put, Preventic prevents tick. From the house of Virbac, Preventic Tick collar is a product dedicated to the killing of ticks. Monsoon is a time of worries in areas prone to tick infestation - ticks are dangerous pests and help in spreading fatal diseases. The most commonly found species include Deer ticks, Lone Star ticks, Brown Dog ticks and American Dog ticks. These ticks are vectors of diseases like Ehrlichiosis, Lyme disease, and Rocky Mountain Spotted Fever. The Preventic Tick collar is the only product recommended by veterinarians to save your dog from ticks. When applied alongside another topical flea-resistant, you can achieve the best possible result for your dog. The collar uses Amitraz as the chief pest-preventive element, which is an antiparasitic effectively used for killing ticks. This element paralyzes its mouth which detaches the tick from the body of the dog before killing it - which is a necessary measure to check re-infestation. The collar starts working within 24 hours of application and provides immunity against ticks for a long enough 3 months. This collar is completely safe for your dog as well as humans who come in contact with it, provided you are using it according to instructions given inside the package. Also, you don’t need to worry about the collar being wet because it’s water resistant. But regular exposure to water can decrease its efficiency. You can always try the long variant and cut it accordingly, but if you have a small dog and want to save a few bucks, this is a safe choice. In case you’re looking for an alternative to flea collar, you may subject them to a flea treatment. The best flea treatment for dogs can get rid of fleas at any stage of their lifecycle. One such product is the Advecta II Flea Treatment. It is safer if you use it on dogs who are 7 weeks or above. If you are using it on cats, it is better if they are older than 8 weeks. But there are still best flea treatment products available for cats. The treatment is quick and effective and works within 12 hours of the drop treatment. The treatment further prevents any chances of a relapse for 4 months. It goes a step further and controls chewing lice as well. If you hesitate to let your pet play out after applying a treatment, this one solves it for you. The Advecta II is waterproof and does not get removed in case your pet gets drenched. Can affect the skin of the pet owner if it comes in contact. While the Advecta II limits itself to fleas and lice, the Bayer K9 Advantix II ventures into the territory of ticks as well. The product will repel any ticks even before they can latch themselves to your pet. It even repels any mosquitoes that might disturb your pet while they are out in the backyard. If you are worried that your pet is too young for most of the flea treatments for dogs, this one is safe for pups 7 weeks and older. The treatment will kill off the fleas in 12 hours. If there is fresh infestation within 2 hours, it will get rid of that as well. Moreover, in case you decide to wash your pet after applying the treatment, the product is resistant to water and shampoo as well. However, the effects last till only 4 weeks when compared to the 4 months that the Advecta II offers. That is the only disadvantage when you compare it to the last product. Effects last up to only 4 weeks. Hartz UltraGuard prevents tick and flea infestation s for a span of seven months. A less pricey collar for prevention of fleas and ticks, this is also an effective solution if Seresto is above your budget. These collars come in vibrant colors and with a clean fragrance, which means no smelly chemical would irritate your dog. UltraGuard uses an altogether different technology to check flea and tick infestation - it produces electricity by friction when comes to contact with the dog’s hide and utilizes this low-frequency electricity to wave off ticks, fleas, and other insects. This is a safe and financially sound bypass to all complicated sounding chemical solutions, isn’t it? Don’t worry about it affecting your dog because electricity that low is only meant to be felt by, well, pests. Moreover, these collars are waterproof, and frequent contact with water doesn’t lower its viability. Which means, once applied, you don’t have to take the collar off the dog until the end of the seventh month. Don’t use it on little bunny pooches, but this product is tested and safe for puppies over 6 weeks of age and older. If you’re looking for an alternative flea treatment for dogs, place your bet on this collar. For better results, bathe your dog with a regular pest repellent available in the market, and afterward, apply this collar to prevent further infestation. Mascot Pets introduces a vibrant and non-toxic way to tackle your dog’s flea and tick problem. The Essential Oil Flea Collar for dogs are not as effective and dedicated a way as Seresto, but it proposes a completely non-toxic solution to fleas and ticks which is provocative on its own. Walking a different path altogether, this flea collar uses 4 essential oils as chief ingredients, such as Citronella, Orange, Geranium, and Peppermint. The gradual release system allows for a slow and uniformly combined release of these four elements over a span of 30 days. The duration is not long enough when compared to other products in the market, but the fragrance that it leaves is absolutely amazing, and the low price compensates for the short duration. The natural mixture helps to repel fleas, ticks, and even mosquitoes, but it will be better if you don’t make it do everything by itself. My suggestion is, use the collar along with another topical flea and tick repellent to ensure better results. The length of the collar is 24” which means it would fit almost every breed, just make sure to cut the extra inches and adjust according to your pet. Not always effective against fleas. ​Slide Note : You may also be interested to know about Flea Treatment for Cats. Check out our Flea Treatment products for Cats. Always keep in mind the size and weight of your dog before buying a flea-and-tick collar. While some collars, like Seresto, provide all-rounder pest-control service, some are dedicated to specific kind of pests and don’t work against others. Know of the nature of infestation before ordering a pest-prevention collar. I can understand how dear your dog is to you, and in my opinion, your dog should be treated with only the best flea collar for dogs money can buy.